* Like Frederick Weber's original set, only the thickest hairs resulting from the harvesting of male kolinsky in Russia's coldest months (January and February) are used. * Males as the primary hunters of the food for the family unit have developed thicker hair over the centuries than the female of the species, which spend more of the winter in the den protecting their young. * Each individual brush is then carefully inspected by the factory manager. * We have found no Kolinsky remotely comparable. * Back off the pressure and you'd think you were painting with a single hair. 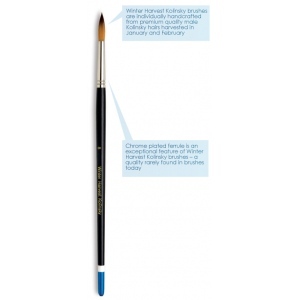 * As a true Kolinsky Brush you need not flick the brush to get the point. * We have found that if an artist needs to flick the brush to get a point that this often results in paint flying in many undesired locations. * You don't have to be royalty to afford it.